Universally the creation of straw art, in any form, requires very few tools. However one tool, in particular, was (and is still) used by thousands of straw workers world wide to create their straw art. That tool is a straw splitter. 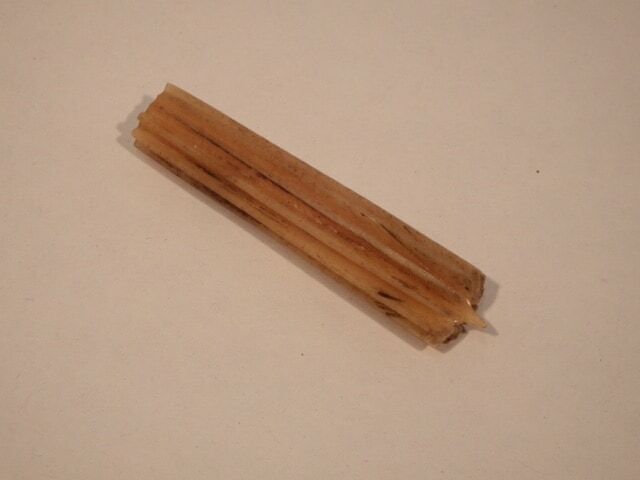 Prior to this invention, straw was split using knives; a slow unreliable, tedious process. 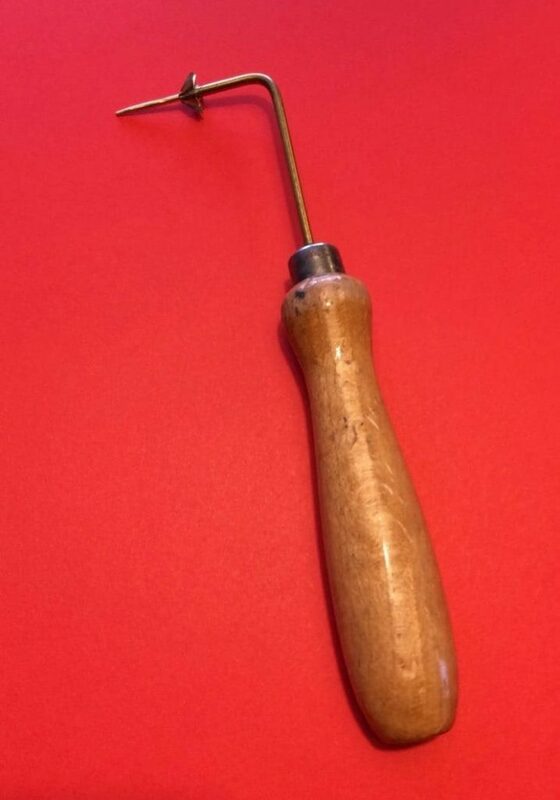 This single tool revolutionized straw work worldwide and was critical to the fashion industry. Although several countries have made claims to this invention, the documented information found in England has been invaluable in our research. No one knows the precise beginning of the straw splitter tool. Is it possible the shape of the straw splitter was inspired by the commonly used osier splitters that are used for willow in basketry? Perhaps these osier splitters inspired what would become splitters for straw rather than willows. In 1795, it is said, a young man named Thomas Simmons of Chalfont St. Peter was sitting in front of a fire whittling a piece of wood. Once finished, he was about to throw the piece into the fire, but a lady visitor stopped him by saying if he had no use for it, she did, and took it from him. Years later, when he was a blacksmith, he remembered the shape and produced the first metal splitter. There are several stories about the splitter’s origin. The most plausible story, in our opinion, relates to prisoners captured during the Napoleonic Wars (1795-1816). The prisoners are said to have either invented or introduced the splitter for their straw work. Some authors claim the place of origin is Yaxley Barracks, Norman Cross, Peterborough, England. However there were other prison depots throughout the United Kingdom where prisoners supposedly produced and sold straw work. We did locate a book written by Thomas George Austin, entitled ” The Straw Plaiting and Hat and Bonnet Trade, with a recent Digest of the Recent Census for the Luton District and an Account of the Increase of the Neighborhood”. In the book written in 1871, he specifically writes about straw splitters. His article reiterates the above claim about prisoners but incorrectly refers to them as French prisoners. The prisoners fighting for Napoleon were not only from France but from Belgium, Switzerland, the Netherlands and Germany and America as well . Another straw splitter appears in Switzerland, appearing as early as 1801. This splitter was also made of bone. 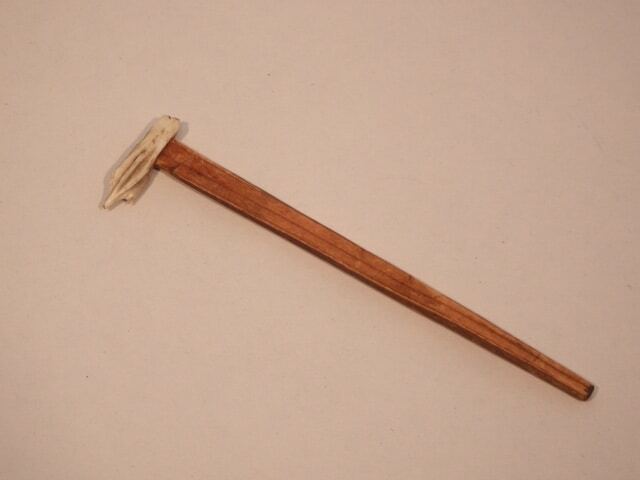 It was made from a length of rounded bone, approximately 3 inches long. The bone was then whittled with sharp ridges (or fins) completely to cut the straw into small strips. On one end of their splitter, a point was whittled out to insert into the straw. From bone splitters, metal splitters emerged. Within a few years, after 1800, the first metal spitters were being produced. Different people are are credited with the metal invention. Including Thomas Simmons as mentioned above. 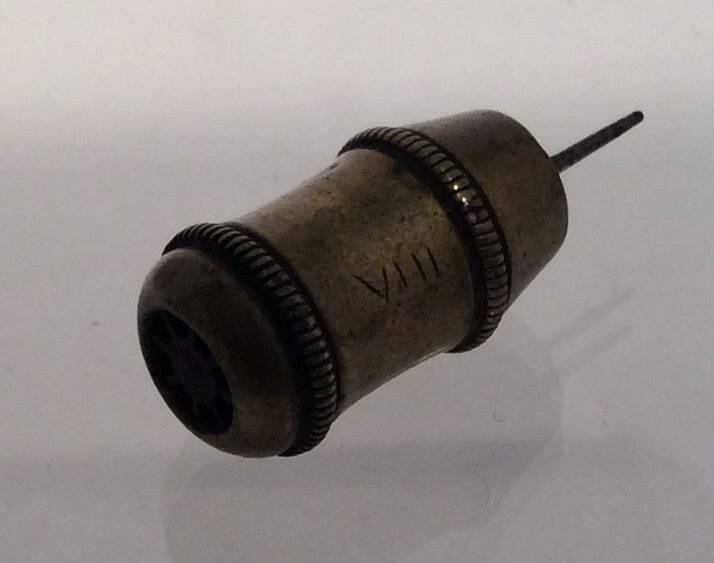 It was much easier to manufacture splitters from metal to meet the growing demand required by fashion at that time. They were made by blacksmiths. This took some experimentation as each and every one was hand forged. No two were ever alike. Some of the stem splitters’ handles are 3 or so inches in length, while others could reach 8 inches or more in length. All dependent upon the blacksmith. 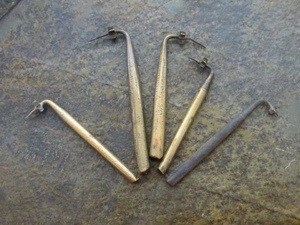 Most metal splitters were very plain, just the roughly polished metal handle such as the examples below. A blacksmith named Norman is credited for having made the first splitter from metal, but a blacksmith named Janes of Edlesborough is attributed as the blacksmith who also made them in iron, but then turned the end downwards at right angles with the stem. The cutters being placed immediately above the point. This soon after became the general form in which it was made, with the same varieties of cutters as at first in bone. 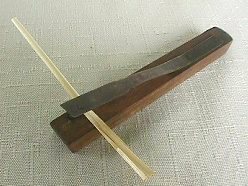 It would not be until later that metal splitters with wooden handles were created. 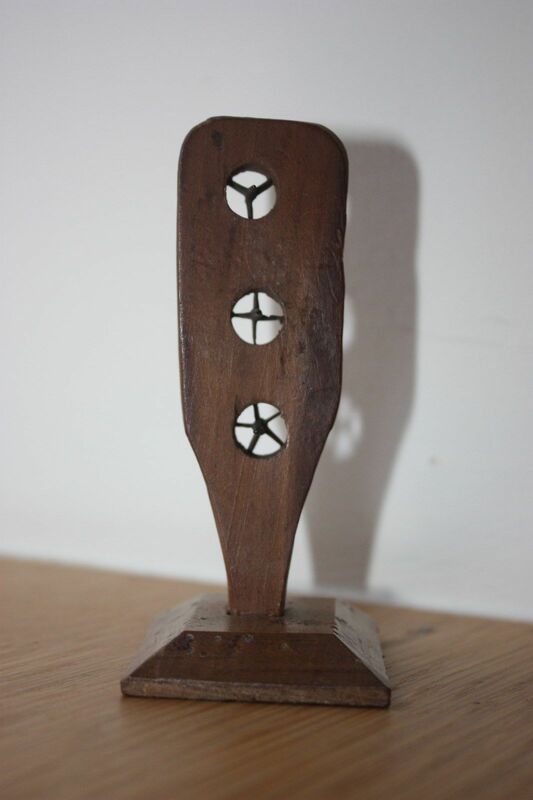 Examples of the wooden handled splitters may be found in the Luton Museum Service Collection in England. 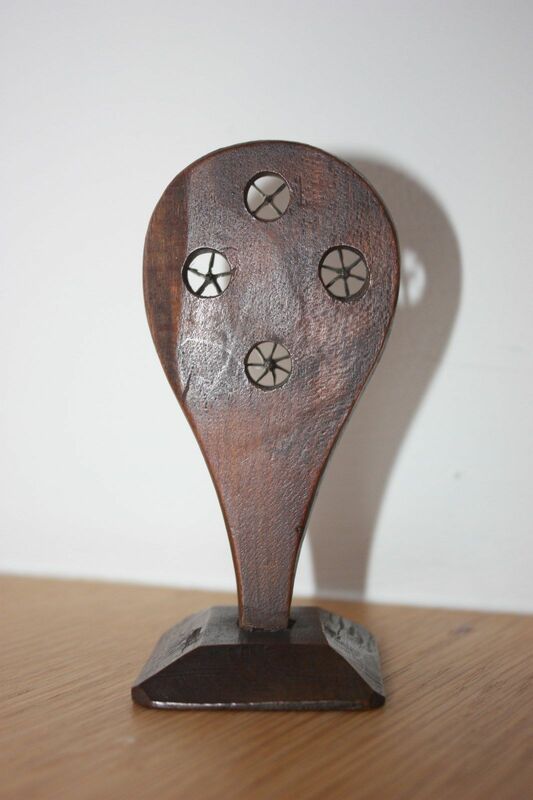 A few years later, in about 1815, other splitters were made in the shape of a paddle, or window, and inserted in a wooden frame, the points projecting in front of each. 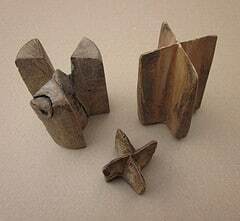 The shapes and sizes may have varied, but the “frame splitter” meant the plaiter was less likely to lose a splitter in the dirt on the floor, or between the floorboards. Dozens and dozens of people made the frame splitter and the mills for plaiters. However there was only one manufacturer who had the foresight to consistently stamp his name on all his wares so that we now can identify his work. This style of splitter was made by the hundreds if not thousands. Most are anonymously made. 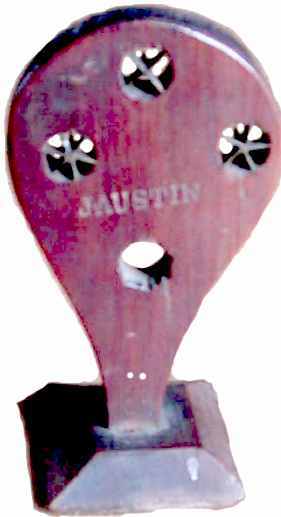 A well known maker of frame splitters and plait mills was businessman J. Austin of Tring. The fact he labeled them makes these pieces seen as special and highly collectable. Other makers also occasionally stamped their names such as Green or Reeve. The frame splitter’s design allowed such versatility due to their ability to contain various splitting sizes. As time went on, the straw worker could have additional splitting sizes added to their frame splitter. Or, more accurately, as this item was made specifically for the straw worker, it was probably the purchaser who determined exactly what kind of splitting tool they needed for their livelihood. Depending on the worker’s need, the wooden frame was capable of holding up to 11 separate cutters of differing number of blades each. We know this as some “signed” splitters have had additional holes bored into the frame on top of the maker’s name. The holes were likely once filled with a splitter now gone. Today it is difficult to locate complete frame splitters. The frame splitter shown below is nearly complete and contains 5 different splitters as described in Thomas George Austin’s 1871 article. We are pleased to offer the following two images of complete frame splitters from The Straw Shop Collection. The first frame splitter is rather unusual in shape as it contains only three splitters. Interestingly the frame has 3, 4 and 5 fins. Collected in England, thought to be from Hertfordshire, although it’s exact origin is unknown. It’s location of use might be better known if the variety of straw used could be identified. The next frame splitter has 4 splitters comprising of 4, 5, 6 and 7 fins. No doubt the worker or workers using this splitter had different sized straw than the worker did in the above splitter photo. Was it primarily for Palm leaf splitting or straw? The answer is open to interpretation. The below image depicts a barrel splitter used in Liege, Belgium in 1873. The barrel, or tube. splitters were also used in Italy. They were made to split from 3-13 splints. Without the straw splitter, the hat industry could not have possibly created the quantity and quality of straw plait required to satisfy the fashion demands. The below image, from 1885, shows a minuscule example of the amount of plait for sale. Amounts such as this were sold year after year. Bundles of plait like the examples seen below were manufactured by any of thousands and thousands of anonymous straw workers using their “sheen”. The straw splitter made this possible. Fast forward 100 years into the twentieth century. 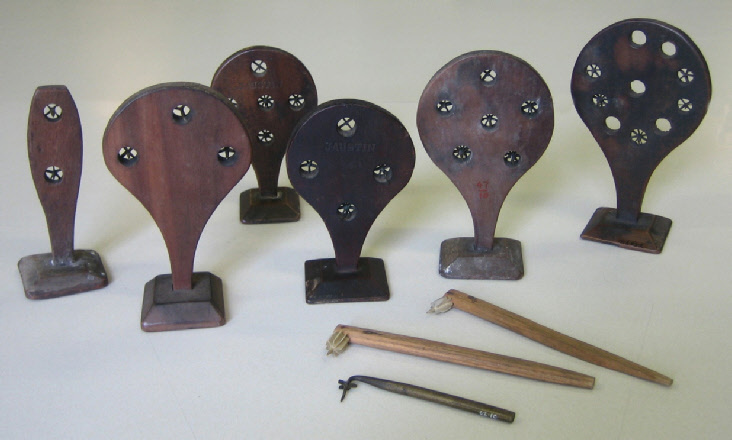 In the 1980s Gordon Thwaites, also of England, was urged by his brother Neil, to replicate straw splitters and visited Luton Museum to closely study their collection. 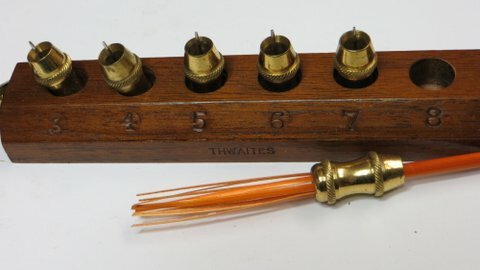 Thwaites made the stem splitters with wooden handles, brass barrel splitters as well as frame splitters. Thwaites’ frame splitter was modeled on the splitters stamped with the Austin name and contained 5 splitters with cutting fins from 3 to 8. 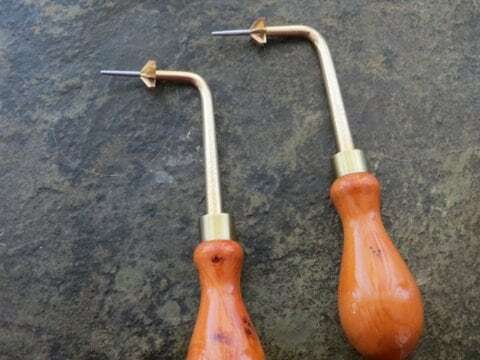 Like Austin,Thwaites’ straw tools are stamped with his name and have become quite sought after as they too are no longer produced by anyone else today we are aware of. 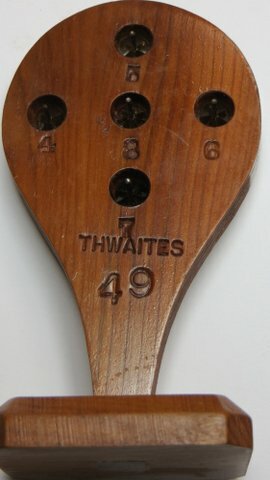 Thwaites also went on to reproduce the Belgium splitter, referred to as a barrel splitter. Finding inspiration from seeing one in the Luton Museum Service Collection he replicated the metal tube splitters which ranged from 3 to 9 fins. Thwaites reproduced hundreds of straw splitters, frame splitters, and assorted straw tools over the years for straw workers world-wide until his retirement in 2011. 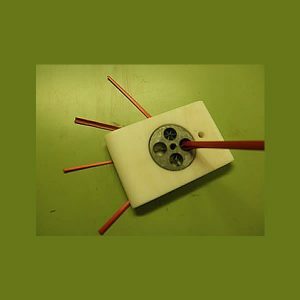 A man, named Rolf Andreas Dietz, in Germany perfected a 6 fin splitter made of plastic after experimenting unsatisfactorily with metal blades for fins from 1984-1990. In 1991 he went on to patent his splitter and has since had three splitters produced in 2, 3, 4 and 6 fins. Due to their shape, these splitters are often referred to as “donut splitters”. Happily this style of splitters are still available today at The Straw Shop. Splitters move into the twenty-first century. Disappointed with knives, the splitter below was designed by Anne Marie Choain of France. A highly respected straw artisan, she was dissatisfied with knives and other tools available to satisfy her requirements in her rye straw marquetry work. She created and patented her tool in 2005. Wishing to have a tool that was practical, multifunctional and complete. 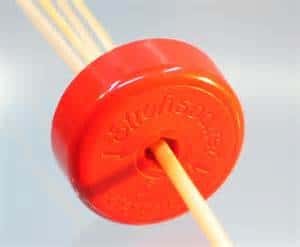 With her multi-splitter, of 2, 3, 4 and 6 fins in a dial formation she also combined a smoothing edge of Teflon to replace the use of a veneer hammer that would not mar the straw. This splitter is approximately 3 1/4 inches long, 2 1/8 inches wide and less than 1/2 inch thick and small enough to fit in the palm of of her hand. Another present day styled splitter is produced in Switzerland. It is called a torpedo splitter and is made of plastic and the 6 fins on the body of the tool are fixed. Similar in style to its earlier bone styled predecessor. The splitter is quite small at 2 inches in length. We have been unable as of yet to learn more about them. They produce varying sizes of splits depending on the material used. Wheat for thin splits and rye for wider splits. In 2017, Walter Kilchmann, from St. Silvester in Switzerland, collaborated with a specialist engineer, named Andreas Beck, to produce highly engineered straw splitters modeled on the design of those previously reproduced by Gordon Thwaites. The splitter will be made to your order with the number of cutting fins you desire; between two and nine fins. 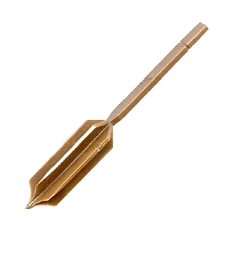 The cutting fins and shaft have been engineered from brass. To ensure a long-lasting sharpness to the cutting fins they have been coated with a hardwearing material called ‘phantom gold’. 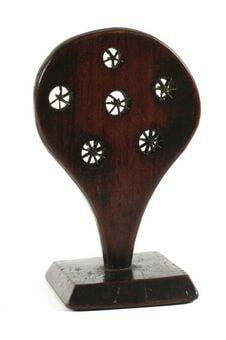 The solid wood handle fits comfortably into the hand. The improvement to this splitter has been to increase the length of the tapered metal guide enabling more stability as the straw is split. Original splitters, of the 1800s, also had this longer guide point. To order your splitter contact Walter Kilchmann: walterbees@gmail.com Price per splitter: 50Chf (Swiss francs) plus shipping. Each splitter is specially made to order and will take approximately one month. The Straw Shop acquired their set available and they are a pleasure to work with. The history of the straw splitter is continuing even today. Although the need for this tool has certainly changed since its creation in the early 1800s, the straw splitter continues to be an essential tool for those working in the medium world wide right up until today. The Straw Shop is grateful to Luton Culture, Wardown Park Museum, Luton, England for permitting us to share images of straw splitters from their collection, otherwise unseen. The Straw Shop is also grateful to Veronica Main for her invaluable research assistance. You may also enjoy seeing additional splitters here.